Participants in the upcoming Great Lakes Sports and Entertainment Law Academy may at interested this new title from the ABA. 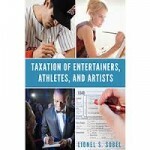 Taxation of Entertainers, Athletes, and Artists by Lionel S. Sobel discusses the U.S. domestic and international taxation of entertainers, athletes, and artists. Topics covered include income, deductions and credits, tax rates, loan-out corporations, deferred and contingent compensation, tax treaties, endorsement income, and more. Each chapter includes practical examples that help explain and illustrate important concepts.